Most think of performance as pushing ourselves to the limit. We see athletes and race-car drivers, mountain climbers and skiers going all in to beat the records. We know there is a stealth focus and fierce motivation behind any performer and we get excited about it, because that sense of passion is contagious. I love the feeling and I get “turned on” by the thought too. Just the fact that I was a competitive gymnast since I was 6 years old should tell you something. I have also been a competitive human for as long as I can remember. The thing is… I retired as a gymnast around 20 years old and at 40 my doctor was wondering how come I had arthritis in my lower back. “Ex-gymnast” I told him, “ah yes, that would do it” was his response. At 55 I have chronic pain in my lower back and I have to be committed to daily stretching and yoga for my lower back to not affect the quality of my sleep or drain my energy throughout the day. Granted I loved my many years as a gymnast, but pushing hard every day is not sustainable. No high performing athletes do, they spend 90% of their time practicing, which includes self-care, and only 10% of their time performing. At work and as leaders we tend to think we have to spend most of our time performing. Now my competitive spirit is still part of my personality and it is a great reason for how I thrive, but not because I push harder, but rather because I self-observe. I learned 3 things from my years as a gymnast that I still keep with me today. You are not competing against the others, you are competing against your own fears of not being good enough. You need a team to keep you engaged in the pursuit of “the something” you are going for. The energy of “together” is far more powerful than the energy of “wanting” because it keeps the WHY in the center of your attention. We practiced because we wanted to become better and we loved gymnastics. In the team effort it was not about being better than each other it was about improving ourselves. My coach always told us that if you take 1 week off from practice, you need 2 weeks to get back to where you were. I am to sure if he said it to avoid us taking too much downtime or if he said it to remind us, to not be too hard on ourselve,s when we would come back to practice. But what I know now is that we need downtime to be successful and perform longterm. Our bodies need time to rest and recover and our mind needs to not be hyper-focused on one thing all the time. Our nervous system needs time and space to switch off, in order to function optimally when on. At least if we want our success to be sustainable and our mind to be a creative and innovative force. In our digital world where we are trying to keep up with technology, we need to remember that our bodies are still the most important tool we have to do our best work every day. Our mind is faster than any computer we can imagine and technology is learning how to catch up with the powerful complex system that our brain is. As energetic beings space and time is a challenge for us. It only exists as a concept and a learned behavior about how things work. Thinking up an idea takes no time, it is the execution that takes time. And effort. The edge of innovation, not exhaustion. To nourish and nurture an environment where we can thrive and be innovative problem-solvers, mindful leaders, and healthy humans we need to learn to give ourselves space and time. To pause. To observe, to reflect, to act. And then pause again. That pause might be to come up with new ideas, plan and execute. Or to eat and nourish the very body and mind that is making all this possible. 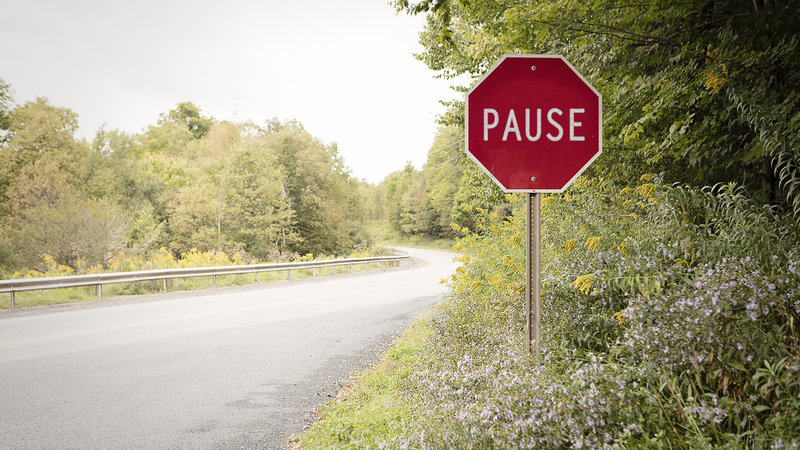 Or to simply just pause for the sake of pausing, because that is how we thrive.